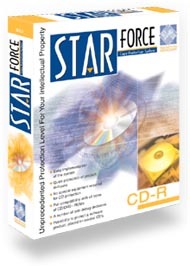 StarForce CD-R is a software complex meant for copy protection of your software distributed on CDS in home conditions which does guarantee real protection. For reliable protection the engineers from StarForce have developed special StarForce CD-R media which can be used in usual CD-RW drives. 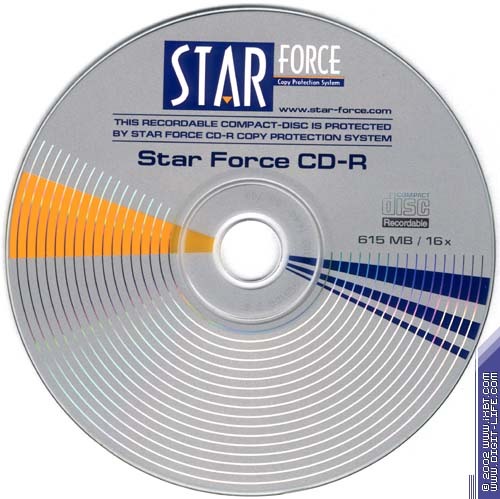 The StarForce CD-R discs are an essential part of protection though they look similar to discs of other manufacturers and have the same consumer properties except a disc size which makes 615MB. The recommended maximum write speed is 12x. The StarForce CD-Rs are produced according to a special technology which, when an application is started up, allows the protection system to determine whether an original CD or its illegal copy are used. In the latter case operation of the application will be interrupted. If a given disc is original, the protected application will work as it should and a user won't notice any traces of protection. These recordable discs can be used only with the StarForce CD-R protection system. In course of installation the protection module gets into executable files of an application which is then recorded onto StarForce CD-Rs by usual CD-RW drives or CD-R duplicators. 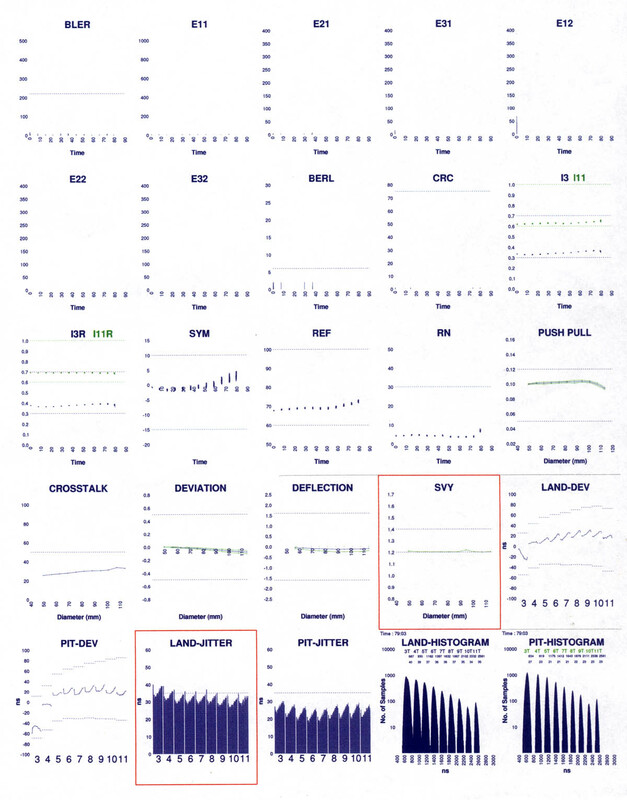 According to the developer, none of other developers of protection technologies has anything similar. An idea of the StarForce CD-R protection system appeared a long time ago, but the development of the finished commercial product ready for the market and meeting the latest requirements of reliability and soft hardware compatibility took over a year of intensive work. Protection Technology first demonstrated this unique protection system at COMTEK 2002: from insertion and recording of the StarForce CD-Rs to start-up of a protected application. 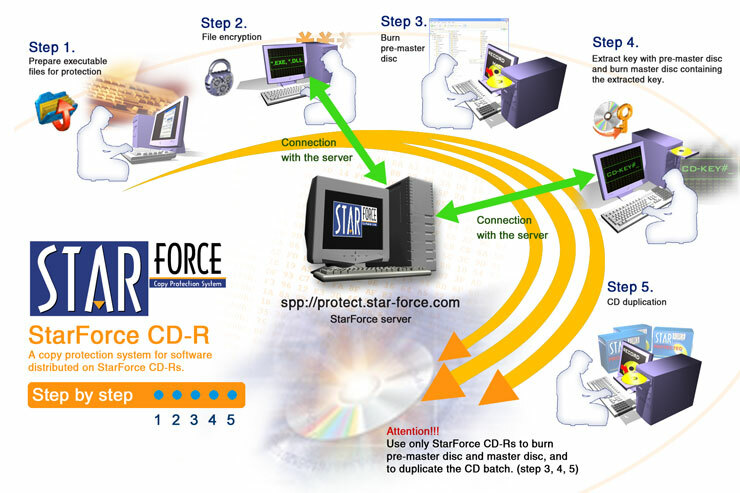 Even at that time the protection was so functional that copies of StarForce CD-Rs with a protected application, cloning with such programs as CloneCD, CDRWin, BlindWrite and others didn't work. A protected disc couldn't be launched with CD-ROM emulators (such as Virtual CD-ROM and others). It's quite important that the StarForce CD-R media is compatible with various models of CD/DVD-ROM devices. It's because the disc surface is not covered with uncopied marks or artificial defects. With the StarForce CD-R Wizard the developer implements encryption of executable files of an application on the StarForce protection remote server. When a distributive of a protected application is recorded onto a StarForce CD-R the developer extracts the key with the help of the protection remote server, using the Wizard. This key will correspond only to the StarForce CD-Rs with given software. When a given disc is duplicated, the key is recorded on each disc. Remember that an end user doesn't need an Internet access to run a protected application. It is needed only for the developer when he sets the protection. However that may be, any protection is a fine system and needs careful testing. And taking into account that a CD-R is a source of potential problems with reading/recording our lab iXBT.com together with Protection Technology carried out a large-scale test of most modern (and not very) CD-RW drives, CD-ROM, DVD and combo drives for compatibility with the StarForce CD-R protection. Each CD-RW drive records a StarForce CD-R at the recommended speed of 12x. 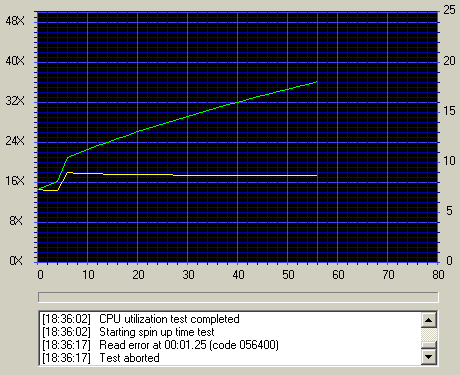 No secret that some drives do not support 12x write speed: - only 8x and 16x. 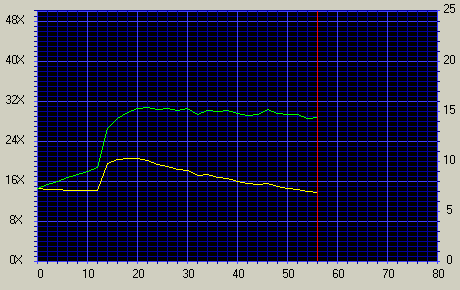 In this case we made the conditions tougher for the StarForce CD-R and recorded it at the closest speed higher than 12x. As a rule, it was 16x. But there were some exceptions as well. For example, for the ASUS DVR-104 DVD-R/RW drive the maximum speed was 8x. After the burning process each recorder had to read not less than 5 test discs recorded on the other drives. The speed and quality of recording were measured with the Nero CDSpeed 0.85e beta and CDROM Drive Analyzer 2.31 test utilities. Quality of the recorded discs was estimated with the help of the professional test station CDCATS SA3 the access to which was provided by the Urals Electronic Plant. The CD-ROM and DVD-ROM drives were to read the recorded media. The data on testing the discs with the CDROM Drive Analyzer 2.31 and printouts of the CDCATS SA3 test station will be published later, on a separate page. The tables given above will also be updated as new drives arrive in our lab. TEAC CD-W552E (firmware T016) - this latest drive from TEAC reads data on a very high quality level, but it refused to record any data on the disc. The recorder can't identify the disc as suitable for recording. DVD-ROM LG GCC-4120B Combo (firmware 2.02) - it identifies blank StarForce CD-R media only every two times; its reading is unstable and slow. CD-ROM CyberDrive CD486D (firmware 150J) - it reads StarForce CD-R discs quite slow, the speed doesn't make operation comfortable. One more CD-RW drive - BTC CCE 128IE - also have stability problems when reading data, but the tests later showed that it read all kinds of CD-ROM and CD-R media this way. The StarForce CD-R is highly compatible with most modern (and not very) CD-RW, CD-ROM, DVD-ROM and DVD+RW/-RW drives. Quality of the StarForce discs is also very high - it's high enough to entrust your data to this media type for long protected storage. Here you can find results of testing the StarForce CD-R recorded on the Plextor PX-W1210TA CD-RW drive at 12x.